A general guide for spiffy logo designs, made from scratch. Don’t be fooled by a logo’s simplistic appearance. It’s simple design does not denote a simple process. Maybe it’s because of their size, but logos and their creation are often underestimated. They’re small, yes, but they are mighty. And designing one tends to take a lot more time than one would think. There’s no set process for creating one. Like most things, it tends to be a matter of preference. So whether you decide to design your own logo or you choose to opt for a marketing firm like ours to design your logo, here’s a general step-by-step guide to logo creation. Because even if you don’t plan on designing your own logo, knowing the process can definitely be enlightening. A lot of the time, many of our clients already have a rough sketch of what they want — and that’s great! But we always send them a design questionnaire regardless. This is our opportunity to nail down what “feel” they’re looking for, what colors they’d like to consider and what imagery they’d like to use. We also use it as a chance to learn a little bit more about their industry or business and, most importantly, what sort of message they want their logo to convey. Once you have a better idea of what your logo will stand for, it makes the rest of the process a lot easier. In addition to learning more about a client’s industry, we need to learn more about their competition as well — if for no other reason than to ensure that our client’s logo is different enough. It’s also a great way to observe what does and doesn’t work for the industry. Research also includes the search for inspiration. Nothing is a better spark to creation than an example. Consider some of the most recognized, long-lasting logos or logos that resonate most with you. What is it that has made their logo stand the test of time? While we certainly never condone copying another logo (for so many reasons), it is perfectly alright to use other logos as a creative fuel for fire, so to speak. This is when we take any and all ideas that we have floating around and bring them to light via the ever mighty pencil and pad of paper. This does not necessarily require an artist’s touch. Even a very, very rough sketch is sufficient in determining the overall layout of a logo and what will and won’t work. After exploring all possible ideas and options, we proceed with no more than three or four solid concepts to build upon. While certainly not mandatory, it’s best to design a logo in black and white first. This will illuminate the overall strength of the design and lend a hand to it’s timelessness. When the time for color arises, it’s best to stick to two to three colors — one major/primary, one secondary and one tertiary — and one neutral color. For a recent client of ours, we pulled together a color palette of 16 to 20 different colors that explored different tones and shades of colors she had selected. This way we could do a side-by-side comparison to determine which colors comprised the best palette. Ah, fonts. Though perhaps a bit underrated, fonts are extremely important. Always stick with something classic and clean — remember: the goal here is to create a logo that will stand the test of time. We avoid fonts that are overly ornate, complicated or trending. Strong fonts are legible when small or large, and they are appropriate and relevant to the message of the logo. Consider the differences between the Barbie® logo font and the font for Wells Fargo, for example, and how they relate to their corresponding businesses. If you’re not sure where to start, check out this list of fonts to consider for your logo. Note: phases. Typically there are multiple and many rounds of preliminary designs that we go through. You just never know what will really work until you see it in a finished form. It’s also important to consider what the logo will look like in different formats — e.g. a business card, a letterhead, a jumbo jet, etc. So, we’ll usually mock up a couple of logos (all of which may have similar elements, but are distinctly different in design), circulate them amongst ourselves to determine our favorites and send those off to the client for review. This part normally takes a couple of tries. Even after the client chooses the logo they like best, there’s still plenty of tweaking to be done to get it juuuuust right. It also helps to run your logo through a quick checklist, like this one, before moving on to the next phase. At last! Once we finally have a clear-cut logo chosen, we set about creating different versions of it — one for a light background, one for a dark background, horizontal and vertical orientations, etc. We then vectorize the logo, which ensures that the logo can be scaled down or scaled up without any sort of distortion or pixellation that would occur with an ordinary image. Why go through all this trouble for a logo? Because a logo is not important merely for its aesthetics. It an emblem of your business’s identity and purpose. It must be simple, strong, relevant and memorable. 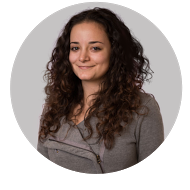 Emmalee Zupo is a Content Marketing Specialist at Inspire, with a background (and her Bachelor’s) in journalism. After years of living in the mountains, she opted for the salty air of Wilmington, NC. She’s a fan. And now she’s tan. (And a poet.) When she’s not wading through words and content, she can be found digesting books and trying to decide which of her rotating hobbies to pursue. The dilemma often causes her to nap. Also, she has dogs, whom she’ll work into the conversation whenever possible.